ICT Skills (en) - "Maurizio Rondina"
Budgeting e ICT managing, costs control, Company’s Information and Communication Infrastructure Management. Installation, Customization, Development and Management for Open Source ERP “SENSO PRATICO” on OpenVms, HP Integrity ed Alphaserver environments, verticalized on small manufacturing engineering, which integrates all areas of their business while maintaining extreme practicality ‘use, flexibility, effectiveness and efficiency, thanks to his full integration with the latest technologies. Guaranteed processing time unimaginable access to the database in a distributed environment via XML and SQL, the reuse of software objects through Java Server Page with XML interfaces, the extreme ease use and full interaction with the Windows environment, Import data from Excel and Access, reports in formats that open directly from Excel and Access, issuing documents in PDF, using messaging systems for the sending documents and records by mail or fax (with management interface) directly from the mail client of the end user. companies can use the ‘ERP users remote branches or remote offices with free Internet connection through VPN, maintaining optimal performance as if they were working at the time. The customer does not pay any license, just advice. It can also prevent ‘buying infrastructure hardware, through the’ use of Server Farm outside. 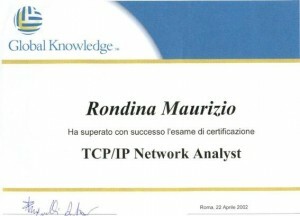 Networking: Ethernet, TCP/IP, Internet, HP Advanced Server, DECnet, Microsoft Networks. TCP/IP Network Analist Certification at Global Knowledge Network. Environments: HP (ex Compaq, ex Digital) OpenVms, Microsoft Windows, IBM AS400. 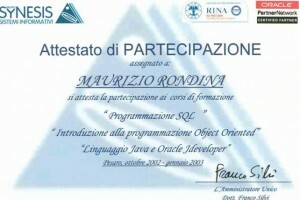 SQL, PL/SQL, XML, DotNet, Cobol, Fortran, object oriented programming on Oracle environment.